China has the world’s second largest stock market, the third largest bond market, and the largest commodity futures market in the world. It is also the largest consumer of major commodities in the world. So, it was no surprise China hosted one of the few prominent global industry conferences on derivatives. On December 1, 2017, over 180 experts and industry professionals by invitation only gathered in China for the 3rd Derivatives Academic Forum to tackle current issues facing this industry. The event included discussions on derivatives, banking, and commodities. Organized by the China Futures Association and research institutes of all four futures exchanges in China (with three of them focusing on commodity derivatives), the conference was a step forward in sparking cutting edge conversations around the research currently being performed. The China Futures Association is a national organization in the futures industry under the supervision and management of China Securities Regulatory Commission. This event was part of the 13th China International Derivative Forum. About 1,400 attendants in total included Mr. Walt Lukken, President and CEO of the Futures Industry Association in the US, along with leaders from more than ten global exchanges outside China. How can future markets better serve our economy? Professor Jian Yang, PhD, endowed chair and research director of the J.P. Morgan Center for Commodities (JPMCC), was invited as one of the keynote speakers at the Derivatives Academic Forum. In his keynote speech, he addressed the market response of international crude oil futures and options to fundamentals. Yang spoke on a topic of much concern to regulators, market players, and research institutions in China and beyond. In the industry, stakeholders need to understand how the futures market can better serve the economy. From his research, he found regulators can better guide the formation of futures prices by regularly releasing high-quality macroeconomic indicators and data on the supply and demand of commodities. Such macroeconomic indicators include the initial jobless claim, the manufacturing index, and construction spending, etc. According to Yang, many investors should be taught to participate in futures trading. This education needs to occur because these are the people who influence commodity futures prices on a daily basis. These prices then determine how effectively futures trading functions, economically speaking. Other keynote speeches addressed the impacts of future markets on capital formation, the macroeconomy, and commodity markets. Panel discussions highlighted the orientation and development pattern of research for the futures industry in China. Yang was also interviewed by half a dozen Chinese national newspapers and China Futures magazine of China Futures Association. 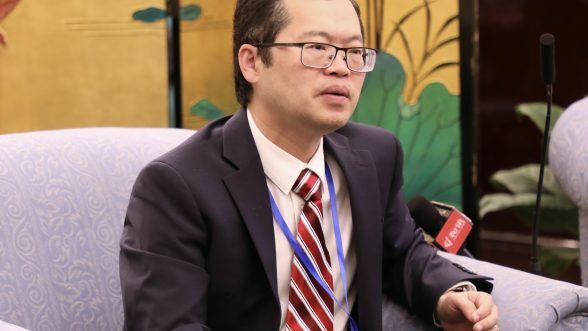 He has since been featured by about ten different news publications in China, including an exclusive interview published in Chinese by the Economic Daily (经济日报), the only national newspaper sponsored by the State Council of China. So, to be featured in such news features in China is of the utmost honor to experts such as Yang. This also brought extensive exposure for the J. P. Morgan Center for Commodities to China, as Yang was quoted as its research director. The University of Colorado Denver Business School established the China Center for Financial Research to help the business community to better understand Chinese stock and bond markets. The J.P. Morgan Center for Commodities’ strength lies in building a stronger understanding of Chinese commodity futures markets. For example, the JPMCC will be publishing research on the impact of China being more open to international investors due to recent policy changes in November 2017. The J.P. Morgan Center for Commodities also hosts its annual international commodities symposium in August each year. The purpose of the symposium is to bring together global thought leaders and prominent stakeholders in commodities to discuss critical thinking and new research related to commodities. The symposium is open to all individuals, academics, and practitioners, interested in new research in commodities. The coming symposium, organized by Yang and his colleagues, stands to take place on August 13-15, 2018.